The Blue Fronted Amazon Parrot's length is about 14.5 inches. General adult coloration is green, the feathers edged with dusky black, particularly on the neck and back. The forehead and anterior lores is blue, the fore-crown yellow tinged with white. The hind-crown, ear-coverts, anterior of cheeks and throat are yellow. The thighs are green suffused with yellow. The under and upper tail-coverts are yellowish-green, the bend of the wing red, the primary-coverts, dark green tipped with violet-blue, and the primaries, green becoming violet-blue toward the tips. The bill is gray, the iris orange, and the legs gray. Immatures are generally like the adults, but with blue and yellow on the head much reduced. In some birds the head is almost entirely green. The iris is dark brown. 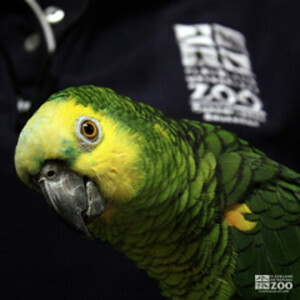 The range of the Blue Fronted Amazon Parrot is northeastern Brazil, south to Paraguay and northern Argentina. The Blue Fronted Amazon Parrot inhabits wooded areas, from humid subtropical forest through deciduous chaco and cerrado woodlands, to strips of gallery forest in mostly open savanna or scrublands. Blue Fronted Amazon Parrot nests are in hollow in trees, or less frequently in holes in cliff-faces. Several pairs may nest close together. Eggs are laid about the end of the first week in April, and the first young fledged about the middle of July. Fruits, berries, seeds, nuts, blossoms and leaf buds. At times they attack crops, causing considerable damage.